It’s the end of an era on the south coast as Debbie Laycock has left her post at England Netball, writes Helen Dunning. Having spent nearly six years in the role of netball development community coach, Laycock finished her last shift this week. And the governing body has yet to announce a replacement for the passionate Portsmouth-based coach. Laycock arrived in the role in 2012 and her list of achievements is impressive. More than 5,000 new players have pitched up courtside for Back to Netball, Netball Now and Walking Netball sessions. An estimated £20,000 has been raised for charities – including Children in Need, Sport Relief, Bloodwise and Cancer Research UK. And around 30 coaching qualifications have been successfully completed – many by those returning to the sport. Laycock said: ‘I’ve had the best six years meeting some incredible people, being involved with life-changing projects and hopefully leaving a netball legacy locally. It really has been my dream job. ‘But the time is right for me to go and I look forward to what’s next. ‘Huge thanks goes to everyone who has helped over the past six years. ‘The achievements and progress we have made is down to a large team of coaches, hosts and volunteers. Many of Laycock’s support team have been paying tribute to her work. 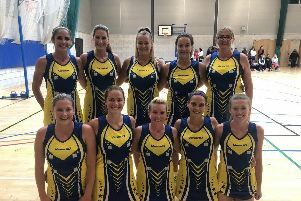 Julie Vugler, who attended one of the original Back to Netball courses and is now chairwoman of Springers Netball, said: ‘Back to Netball has provided a way into local leagues and social leagues for so many people. ‘New teams have formed as a result of Back to Netball and I found my way to Springers. ‘Before then, I hadn’t realised Portsmouth Netball Association existed. ‘I think Back to Netball and Walking Netball has encouraged people from all walks of life, gently, back into sport. Katie Tabner, one of Laycock’s army of volunteers and a recently qualified coach, added: ‘There are so many people involved in local leagues now who have come from Back to Netball. Janine Robinson is also an original Back to Netball player and is now a coach leading her own sessions. She said: ‘I have made some fantastic friends who – without netball – I wouldn’t have met. ‘Back to Netball has also affected my life positively in other areas. ‘I’ve developed my coaching skills and confidence, passing not only my Level 1 coaching award but my Level 2 as well. ‘My favourite memory is my first session – finding like-minded people who hadn’t played for ages meant I felt comfortable coming back and not out of my depth. ‘The legacy includes friendships formed and participants re-finding their love of the sport. Laycock’s tenure as netball development community coach for England Netball began in 2012 in Southampton. She had responsibility for the organisation, promotion, delivery and sustainability of the Back to Netball project. Since then her work has grown into areas including Eastleigh, Fareham, Gosport, Portsmouth, Havant and Petersfield and initiatives including Walking Netball and Netball Now. Laycock has earned a reputation as a trailblazer, working with Age Concern and Age UK on a seated-netball programme, as well as writing the Back to Netball page in the Netball Magazine for the past two-and-a-half years. Kelly Wallis, who has qualified as a coach and Walking Netball host under Laycock said: ‘What’s been achieved in the past six years has been a huge accomplishment. ‘I think Debbie has had the time of her life and feels very lucky to do what she loves and get paid for it. ‘By far her top achievements are the Making the Difference trophy at the Energise Me Sports Awards and the legacy she has left on leaving England Netball. ‘Netball is in a much better place for her being in post and her efforts means it all continues. ‘She has always said if something happens tomorrow, we need to make sure plans are in place for it to continue. She’s certainly achieved that. While Laycock has not spoken about new challenges, she is not turning her back on the sport she loves. She added: ‘One thing is for sure I won’t be far from the netball world in the future.